Medulloblastoma is the most common malignant pediatric brain tumor. More than 350 children are diagnosed with the cancer each year in the United States. Standard treatment involves surgery to remove the tumor followed by chemotherapy and radiation. One-third of children succumb to the cancer. For the two-thirds of children who do survive, many have severe, lifelong side effects from the treatment, including cognitive impairment and increased risk of other cancers due to the DNA damage caused. 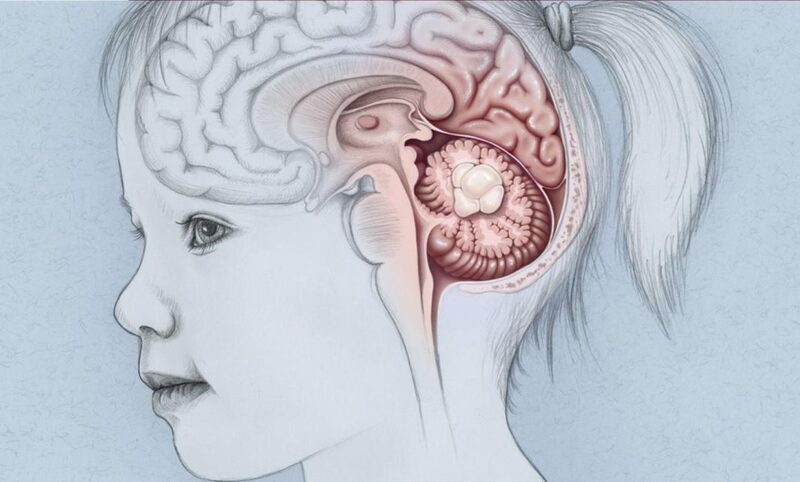 In recent years, scientists have learned that medulloblastoma is not one disease, but four distinct subtypes that differ in the mutations that cause them, in the cells from which the cancer arises, and in the likelihood of long-term survival. A subtype called Group 3 medulloblastoma is the deadliest form of the disease. This paper builds upon the scientists’ previous work studying Group 3 medulloblastoma, in which they demonstrated that a transcription factor called GFI1 is turned on in about one-third of Group 3 tumors. In the previous study, the scientists used genetic analysis approaches and SBP’s unique method for creating mouse models of medulloblastoma to confirm that GFI1 is critical for these tumors—a key indicator that a drug target is worth pursuing. However, transcription factors are inherently difficult to target therapeutically, earning them the nickname “undruggable.” So, the scientists searched for an accomplice of GFI1—a protein that interacts with it and that can be more easily targeted. Their quest uncovered the epigenetic modifier LSD1. The scientists obtained an LSD1 inhibitor and tested it in their mouse model of GFI1-activated Group 3 medulloblastoma. Their studies showed that the drug dramatically decreased the size of tumors grown under the mouse’s skin—shrinking the cancer by more than 80%. This suggested that it could also be effective against patients’ tumors if it could be delivered to the brain.